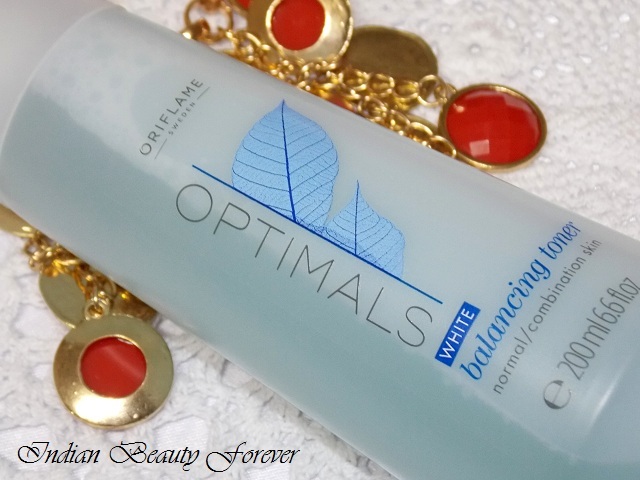 Few days ago, I had reviewed Oriflame Optimals white gel cleanser and there I had mentioned that, I am using the cleanser along with this Oriflame Optimals white balancing Toner, which I will review today. I have already informed you about this entire new range which has been named as Optimals and includes the entire skin care regimen products like cream, toners etc. Price: This Balancing Toner is priced at 499 rupees for 200 ml bottle. 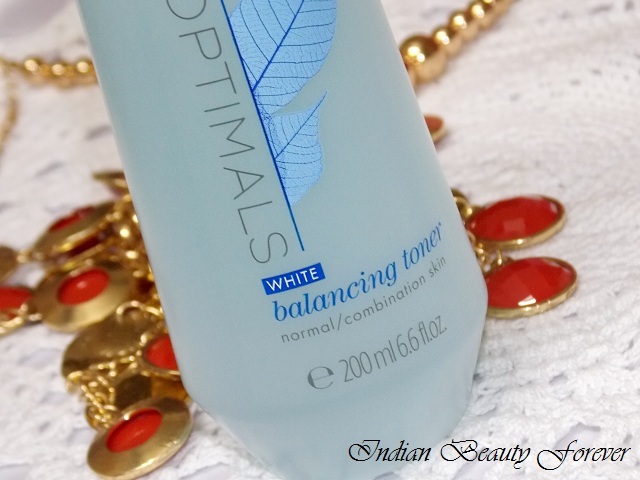 Optimals white balancing toner comes in a see through bottle with a tight cap and a tiny hole to take out the product. It is sturdy and can be said as travel friendly though it would be good not to put your liquid product bottles upside down while you travel or you can transfer some of it into tiny travel size bottles which would be much better rather than carrying a bulky bottle along with you! It has a mild flowery, plant like subtle scent. In the bottle it appears light blue though is watery both in appearance and lightness. It isn’t frothy or soapy like a lot of other toners. After the Clinique Clarifying lotion, this is the only one that I find isn’t soapy or too frothy. 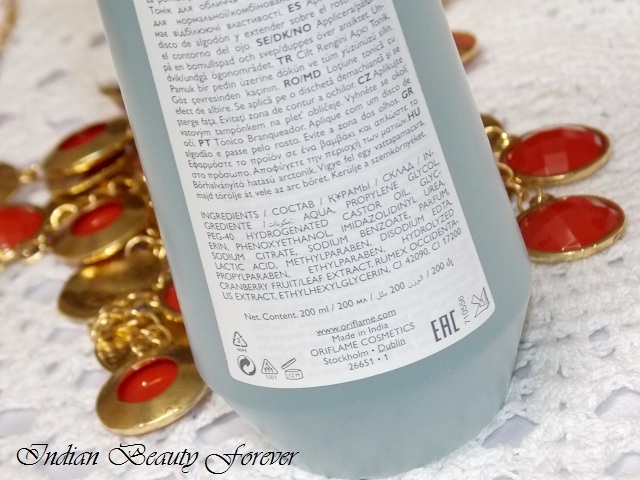 It has some froth which most toners do have but nothing too much that can give the skin a greasy feeling that lingers on! Once applied, it doesn’t pass on a cooling sensation on the skin just a slight refreshing feeling is all I get. I like to use a cotton pad and take some over it after which I will gently dab the cotton pad on my entire face concentrating a tad more on the T zone. As soon as I finish applying it, it feels sticky and within seconds the skin feels satiny neither dry nor greasy. After this step, I carry on with my day or night skin care routine. It really sticks to its name which is to tone the skin and also shrinks the pores. The toner along with the cleanser gel has really made a great combination for my skin this summer. I have seen that the pores on my nose, which is my biggest concern, are lesser visible. Not only this but there a pore which was slightly bigger in size than the others which I used to find difficult to cover even with the foundations, has diminished due to which it is far easier to tackle and hide it! I noticed all this after a week’s time I started using both the products. There is no way, I shouldn’t be impressed with this product. I really liked it and hope that it suits me the same way as it’s really hard to find a product that can actually suit you the best! The toner bottle contains 200 ml though will get finished sooner that the cleanser which is of the same quantity. It will probably last me for 2 months more or less. At 499 bucks, if that continues to suit me, I would love to purchase it over and over. I think a spray pump would have been better. 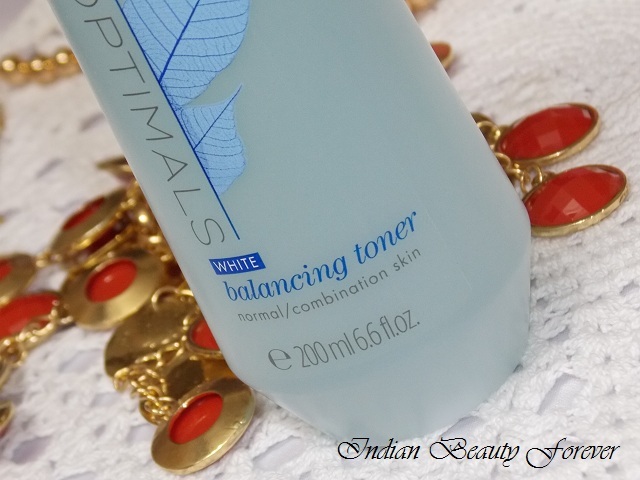 Take: Oriflame Optimals white balancing toner does what a toner is supposed to do. Its mild and alcohol free formula tones, minimizes the pores, makes sure that the skin isn’t too dry or greasy making the skin ready for the next step in your skin care regimen. It hasn’t break me out or irritated the skin rather it soothes it. I am really liking the way this toner has worked for my combination skin and would recommend it to those of you with normal to combination skin.